When it comes to annual game franchises as big and as long-running as FIFA, that yearly release cycle usually produces all-or-nothing entries with either game-changing developments or ones that change little but the kits and the cover star. FIFA 19 falls somewhere in the middle of these two camps, offering an experience that builds on last year’s gradual improvements while adding a series of small adjustments that continue to push the series in the right direction (even if those additions aren’t particularly groundbreaking). The Champions League license makes its entrance in this year’s installment, cementing the authenticity of FIFA - and EA Canada has certainly made the most of it. Along with the Europa League and the Super Cup, you’ll get the full CL experience in Ultimate Team, in Career mode and even in the narrative-driven The Journey mode. With the full pomp and ceremony of the TV package - including that theme song and the team of Derek Rea and Lee Dixon on commentary duties - it comes with the authentic polish you’ve come to expect from FIFA. There’s a lot more actual football this year, and while it’s sad to see the saga draw to a close, Alex Hunter's story goes out with a bang, thanks to its greater focus on Kim’s dream of becoming a pro. It never quite commits to the hinted commentary on sexism and marginalization in football, but we’re hoping a future version of the mode continues to give female players a spotlight (even if the entire game still lacks any other female representation). Unfortunately, if you’re playing on Nintendo Switch, The Journey: Champions isn't supported as it uses the Frostbite graphics engine and the Switch version uses a custom engine to suit Nintendo's hybrid machine. When it comes to the ebb and flow of gameplay, EA Canada has done more than simply add custom celebrations, with the new Active Touch system adding a more realistic set of physics to the ball. It impacts first touches most of all, requiring you to balance momentum and position, but it also allows for more creativity and individuality such as feints and traps. When paired with the improved Real Player Motion system (which gives pro players the physical traits and mannerisms of their real-life counterparts) real life player behavior and individual skills impact one-on-one battles. Timed Finishes also make their debut, enabling you to tap shoot a second time as you strike the ball. You have a tiny window of opportunity to make the most of it (especially when you’re taking into account power and elevation), but nail the timing and you greatly improve the accuracy of your shot. It’s a neat balance that rewards those who keep their cool under pressure in the penalty box, and can turn the most chaotic of scrambles into a top-corner screamer. It’s the kind of tactical addition that really changes scoring opportunities in Ultimate Team or any other online aspect of the game. Finally, there’s an improved approach to 50/50 challenges. Now the size and momentum of a player serves a far more pivotal role in who wins the fight for a ball in the air. There are so many variables now at play - including how fast you are to react - that these 50/50 challenges come out feeling a lot more natural in their outcome. Much like everything else EA Canada has added to the flow of the action, it simply adds to an already addictive and engaging formula that’s served the series well since its move to the Frostbite engine. FIFA Ultimate Team (FUT) has also had something of an overhaul, with the online season structure dropped in favor of a new Divisions setup. It actually makes a lot more sense and enables you to progress through the ranks with a clearer path based on your skills and overall performance. With the added sheen of the Champions League - and all manner of cards you can unlock via The Journey - FUT is still the same time-sink it’s always been. Unfortunately, that does mean there’s still a heavy emphasis on micro-transactions and the grind is still all too real, but it’s by far the most optimized version yet. While it’s not going to go down as one of the groundbreaking installments in the series’ decades-long history, FIFA 19 nevertheless does everything it needs to do to improve the most-loved football simulator on the planet. The Active Touch system informs almost every part of on-field play, from first-touch decision right through to the adjusted 50/50 battles. 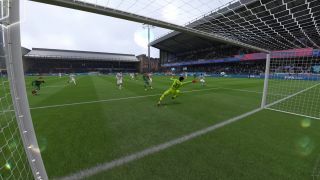 The addition of the Europa and Champions League steals Pro Evolution Soccer's last exclusive boon, and timed finishers weave in a little more finesse and tactical nuance to the age-old art of shooting at goal.